this month, i was assigned so tasty, so yummy, a fantastic blog full of wonderful dinners, fab desserts, + scrumptious sides. after looking through lots of recipes, i narrowed it down to trying sriracha chicken tenders, a caramelized onion, spinach + goat cheese pizza, or these cinnamon roll muffins. while my savory side normally beats out my sweet tooth, on this particular day i was jonesing for a sweet, so the cinnamon roll muffins won! i gathered up the ingredients, + got bakin’. so, how did they turn out? delicious! 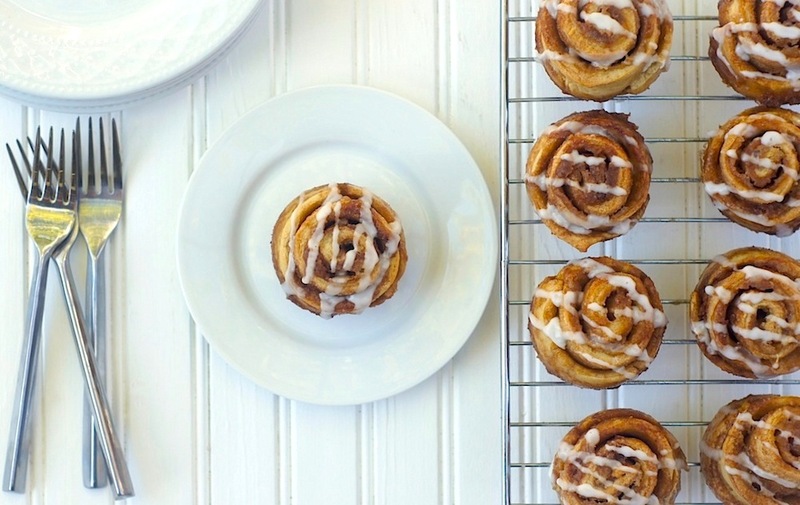 ooey, gooey, sweet, buttery, + rich, just like cinnamon rolls should be. cinnamon rolls are one of my favorite decadent breakfast treats, but the normal yeasted version takes planning + time, often requiring an overnight rise. this muffin version, though, requires no yeast + thus, no rising time. from start to finish, including baking, these were done in about 30 minutes. amazing AND quick to make = how awesome is that?! thank you to katie for introducing me to these fabulous pancakes, + to the secret recipe club for connecting me, yet again, with fantastic bloggers + amazing recipes! measure the brown sugar, baking soda, salt, vanilla, + egg into a mixing bowl. add the buttermilk, then the flour; stir until thoroughly combined into a dough. turn the dough out onto a lightly floured surface + knead for 2 minutes. roll the dough into a 12×24 inch rectangle + spread with the melted butter. sprinkle with the brown sugar + cinnamon. roll the dough into a log beginning with the wide side. stretch slightly. cut into two-inch pieces + put these pieces into a greased muffin tins or cupcake liners. bake at 375 for 20 minutes or until golden brown. allow to cool for 5 minutes in the muffin tin, then transfer to a wire rack. make the icing: combine the powdered sugar, milk or cream, + vanilla (optional) in a small ball until it forms a icing consistency. if it seems too thin/watery, add more powdered sugar. if it seems too thick, add a bit more milk/cream. drizzle the icing over the tops of the muffins decoratively. This is my favortiest muffin ever!! I love the first picture, Amy! Absolutely stunning. =) thank you for making something similar a few weeks ago, which inspired me to make these! Brilliant! These look crazy delicious. There is something about a good cinnamon roll that is oh too satisfying for me. Perfect with a cup of joe! Great job Amy. apology accepted. =) congrats to your colts! Amy, these are stunning! I need these sitting on my breakfast table Saturday morning–they look fab! Yum! I absolutely LOVE homemade cinnamon rolls. I demand that my mom makes them every Christmas. So I have no doubt that I would love these! I love cinnamon rolls but hate the time it takes to make them. So, I love the fact that these are muffins! So much easier. GET OUT! These look freakin’ awesome. I don’t even know where to start!! These look incredible & your photos are fantastic! amy, what an awesome recipe! these muffins are so cute! 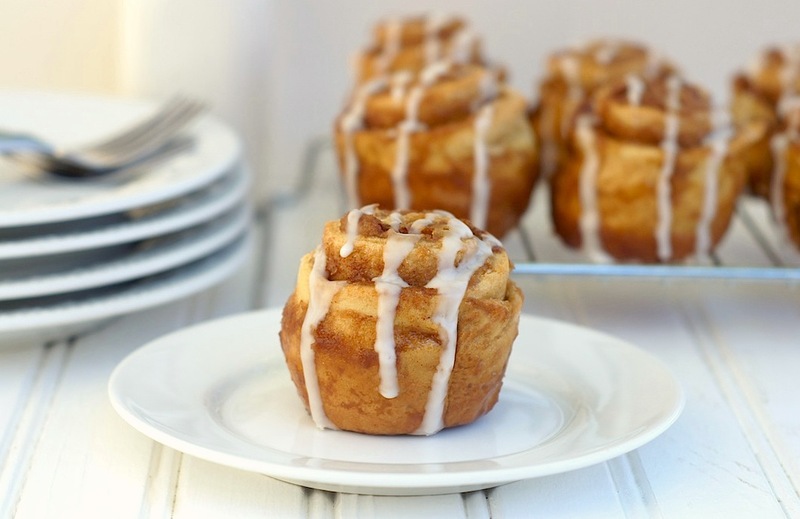 Cinnamon roll muffins? My mind has just been blown! Another OMG moment! Another genius recipe! I like it when baked goodies don’t involve yeast! Yay! Oh my. I want a few pieces to-go, please? LOVE these!! I made them forever ago, and kind of forgot about them. My son just asked me yesterday if we could make them again. I make yeasted cinnamon rolls all the time, but I love the look of your muffins! I’m sure they too would be a hit in my family. These are so pretty, I’d love one right about NOW! Catching up on my blogs and these totally jumped out at me. They are stunning. I’m totally bookmarking this recipe for sure. Hello! New baby blogger here! Thank you, Megan! We actually own two Donna Hay cookbooks =) so that’s a wonderful compliment to me. Welcome to the wonderful world of blogging – I’m sure you’ll do fabulously! I just found this recipe through Pinterest I believe and made them just this morning and so enjoyed making them and it was so easy! AND delicious!! My family and I really enjoyed them Our oven is down so we are limited to whatever we can bake in an oven roaster…the muffin tin pans fits inside one and gave us a delightful treat this morning! Thanks for posting this, I look forward to looking through your site here! And will be posting this recipe on my own blog this week. I’m so glad you found these, made ’em + loved them! And I hope your oven is all fixed soon. =) Thanks for your kind words, Hannah!